Refurbished PCs not only save you money but can often outperform new ones. Typically our refurbished systems have little to no signs of wear and can be bought at a fraction of the cost of buying new. They can also be upgraded with additional RAM or an SSD to give performance that exceeds a lot of new machines. 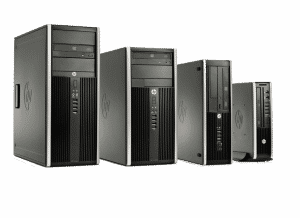 We offer a large selection of refurbished PCs of varying specification for home and business users. All budgets are covered and we can supply PCs in full or without peripherals such as keyboard and mouse to ensure you only pay for what you need. The simple answer to this is nearly everyone. Unless the latest cutting edge technology is required for gaming or high end workstations, refurbished may be the way forward. Businesses - The vast majority of our systems come with Windows 10 Professional which is ideal for business. We also stock a range of computers with older software for when serial or parallel ports are needed. This is particularly useful for industrial purposes. Home - Great for internet browsing, emails, office work and all standard uses. In addition we also have fantastic mini PCs suitable for media servers. If you have any questions then the next step is to fill in the contact form or speak to one of our experienced engineers. As a Which? Trusted Trader you can be assured of receiving the best possible service.